At the invitation of the University of Tsukuba, Japan and SEAMEO Secretariat, SEAMEO RETRAC delegation headed by Dr. Ho Thanh My Phuong, Center Director attended the two International Symposiums organized back-to-back with the 36th SEAMEO High Officials Meeting on February 21 to 22, 2014. 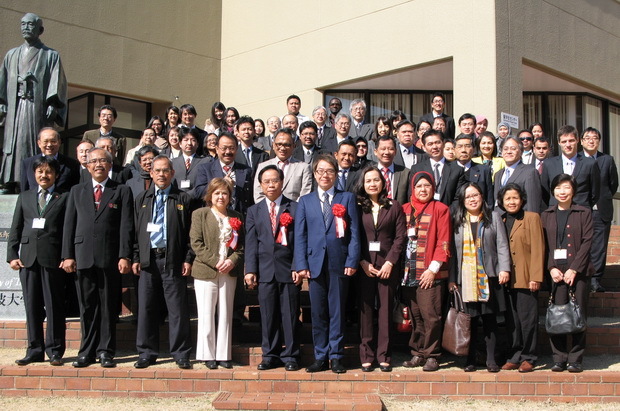 The University of Tsukuba-SEAMEO Secretariat International Symposium on Bridging the ASEAN Community and Japan through Education aimed at introducing education innovations in Southeast Asia and Japan, as well as establishing linkages between SEAMEO and educational institutions in Japan, particularly at the University of Tsukuba. The symposium also featured SEAMEO College as a key initiative in strengthening capacity to promote education and social development in Southeast Asia. At the symposium, Dr. Ho Thanh My Phuong, in the role of one of the Lead Centers of SEAMEO College, presented a paper on Module 3 of the Project as well as a brief introduction of SEAMEO RETRAC operation to Japanese counterparts. The symposium ended up with a networking session where SEAMEO Centers, University of Tsukuba and other institutions had opportunities to know each other better and discussed potential areas of partnership. One day prior to the University of Tsukuba-SEAMEO Secretariat Symposium, a related symposium was organized by the University of Tsukuba and SEAMEO RIHED on the New Directions in Higher Education for the Development of Global Human Resources on February 22, 2014.